I recently talked with Jim Howard, the CEO and co-founder of SentiAR. 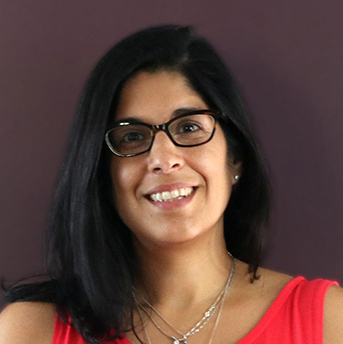 The St. Louis-based startup uses technology originally built by founders Dr. Jennifer Silva and biomedical engineering professor, Dr. Jon Silva, PhD at Washington University in St. Louis. 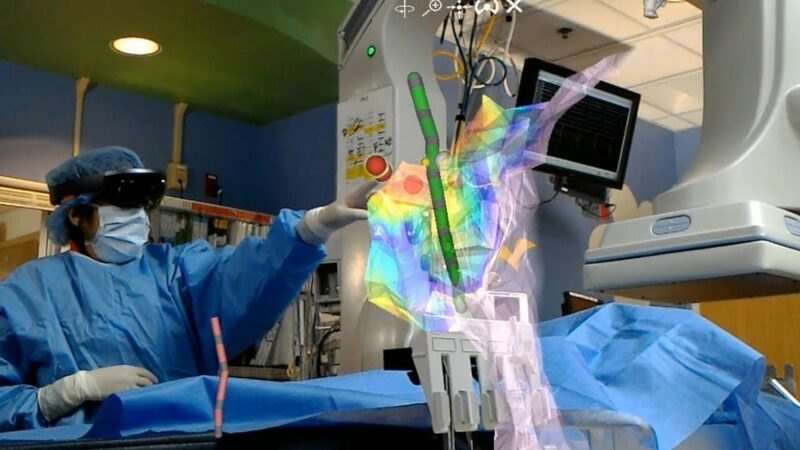 Their drive to bring augmented reality into the clinical setting is helping to transform interventional cardiac procedures. In fact, the company was recently awarded a $2.2M National Institutes of Health (NIH) grant. We are excited that the NIH Small Business Innovation Research selection committee—comprised of our peers in cardiology and engineering—saw the value of our solution and the potential impact it could have for patients and practitioners. 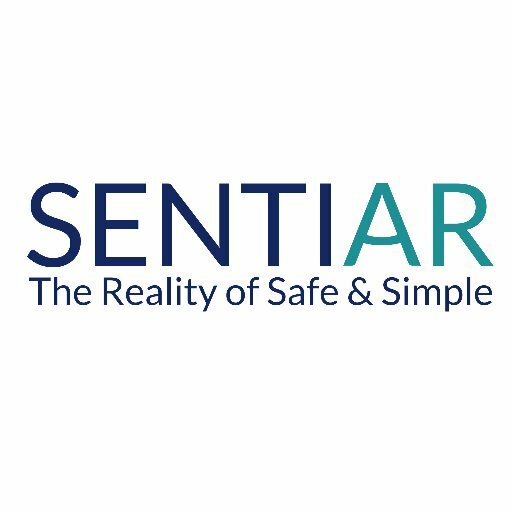 SentiAR has developed a Microsoft HoloLens-enabled intraprocedural 3D augmented reality platform. SentiAR provides real-time holographic visualization of the patient’s actual anatomy in the clinical setting, literally floating over the patient. The key here is the “real-time” aspect of SentiAR’s technology. 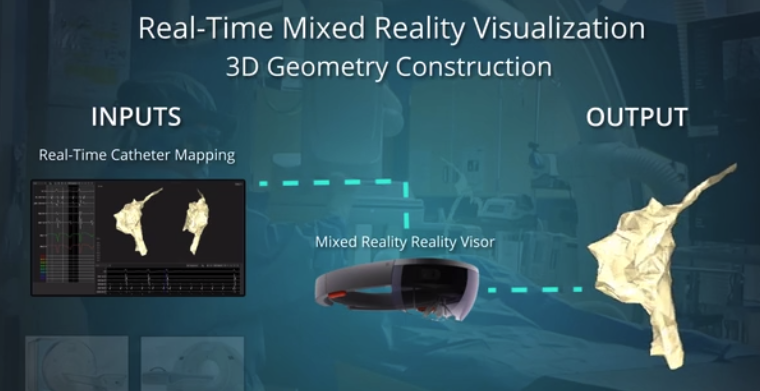 While companies like CAE healthcare have been using HoloLens for holographic mixed-reality training simulations, SentiAR is one of the first to offer a live real-time view of the patient’s actual anatomy in the operating room. Heart arrhythmias are a common health problem. Some arrhythmias are so brief (for example, a temporary pause or premature beat) that the overall heart rate or rhythm isn’t greatly affected. But if arrhythmias last longer, they may cause the heart rate to be too fast or too slow. The heart rhythm can become erratic. If that happens, the heart pumps less effectively and surgical intervention could be required. The specialist for cardiac arrhythmias is the electrophysiologist (EP). They use a device that burns (ablates) areas of the heart to change the rhythm. It is a highly precise procedure. For EPs, visualization is everything. Traditionally, they use small catheters that are inserted into the body to map the heart and ablate areas that impact the cardiac rhythm. The electrophysiologist then monitors the effects of the ablation procedure via large flat screens that hang from overhead. 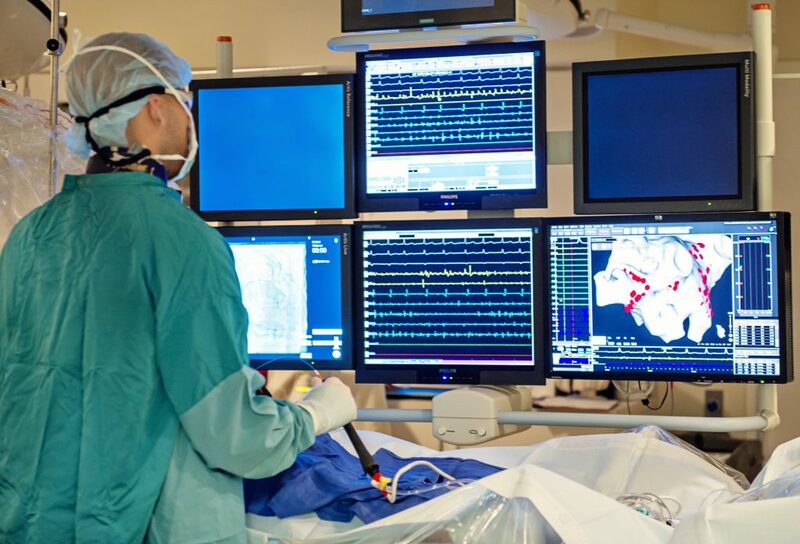 Electrophysiologists traditionally use flat-screen monitors to track their ablations. 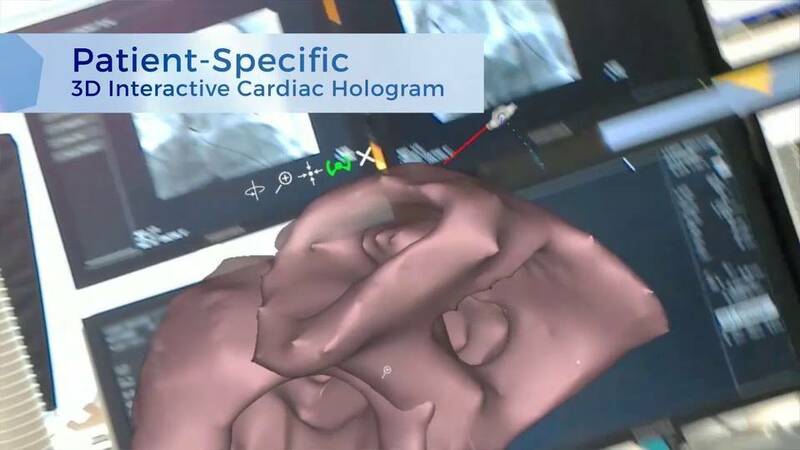 With SentiAR, the EP will also use Microsoft HoloLens which brings a 3D holographic visualization of the patient’s heart into view. The doctor can not only see the patient’s specific heart anatomy, but they can see the exact placement of the catheters and ablations. Intended to reduce time and offer a higher level of precision, the SentiAR platform does not require an additional catheter to work. It uses the existing mapping technology present in the devices the EP already uses in the procedure. The visualization is fully controllable and “hands-free” by the clinician. It provides an ergonomic breakthrough for the treatment and analysis of cardiac arrhythmias within an interventional catheter lab environment. With SentiAR, the EP can expand, measure or enter the heart chambers for an immersive view. Through a partnership with Abbott, SentiAR presented a poster at the American Heart Association/American Stroke Association annual conference last year. 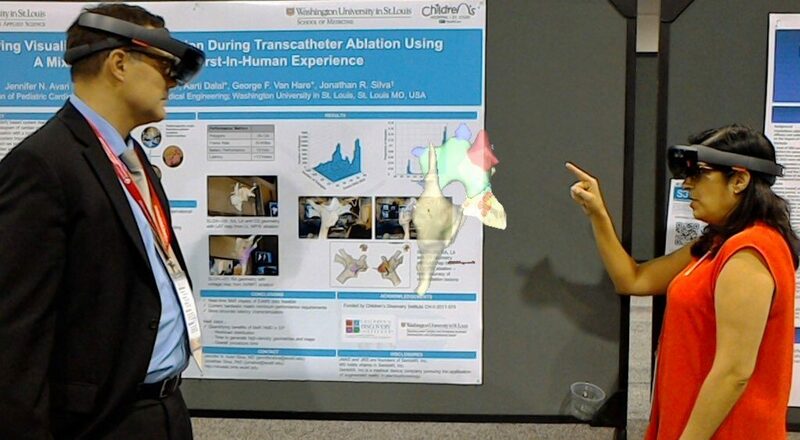 It provided evidence of feasibility in using Microsoft Hololens to improve visualization and interaction during cardiac ablation procedures. SentiAR has also tested their technology with actual patients at Washington University through a clinical trial. Latency, frame rate, battery life and accuracy are critical factors of success. They are submitting to FDA for 510k clearance as a class 2 device. This year, they will be showcasing the SentiAR technology at the Health Rhythm Society annual conference. And you can meet the team at Augmented World Expo May 30-June 1, 2018 in Santa Clara California.